Enchanters of any form are exotic and dangerous icons. They speak with clarity, conviction, and a silver tongue that is ready to bend anyone down to their will. And, occasionally, they call upon mighty powers that those who witness can only speculate from where it comes. Combine looks, skill, and otherworldly magic into a single form and you know that you’ve got some trouble on your hands! Even when they speak of their mighty lord, their one god, their flaming prince or emperor of light, we are all left wondering if this sorceress is truly a proxy for such a powerful divine being or if they are somehow enacting a trick instead of a miracle. In the end, does it really matter!? No matter what they are doing, it is hard to argue with that dominating eye. Ultimately, we find ourselves following wherever we are bad. We may achieve tasks that we do not understand for goals that we’ll never be fully explained. All the while, we wait in desperate hope that we will once again see evidence of that flaming magic… or perhaps we’re just hoping never to have to face it again. No matter what your followers choose to believe, all that is important is that they have faith in you as you have faith in your calling. 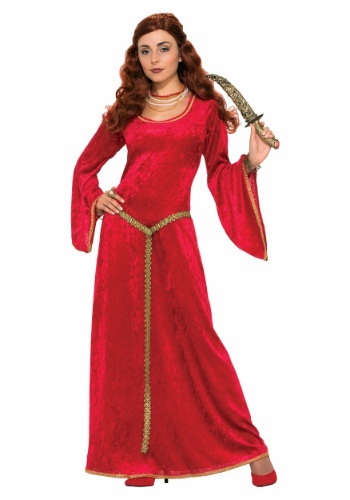 For you are become like unto a lord of light when you step into this Ruby Sorceress costume. This polyester dress has a vivid red velvet finish and a bright gold braided trim at the sleeves and hemlines to better illustrate your command of the flames. The attached gold belt makes for the perfect accent and matches the golden lace in the back. Accessorize with the right sorcerous implements, whether a channeling orb, curved dagger, or of course the ever-burning light of eternal fire… though that last one rarely stays in stock for long.